Across from the beach, this Biloxi hotel is a mile from Beauvoir and within 3 miles of Edgewater Mall and Biloxi Lighthouse. we stay at this hotel all the time from the start of their remodling and always have had a great time this time everything just went great from check in to check out the room was great the employees were very nice I give it a perfect 10 this trip got the room we always love to stay in made our working trip more then just a working trip we had a blast thank you Breakfast was nice for a early start to our day. Great property,awesome room,great breakfast.Awesome shower was like a massage,great location close to everything. Where to find Biloxi hotels near an airport? How can I find hotels in different Biloxi neighborhoods? Where can I find hotels in Biloxi that are near tourist attractions? 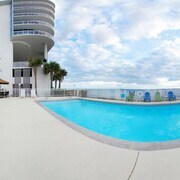 If you are wondering where to stay in or near Biloxi, there is a great assortment of suitable options. Expedia has 39 hotels within 0.1 kilometres (0.06 miles) of Biloxi's central area. The Beau Rivage and Best Western Oak Manor are among the more centrally located accommodation options in Biloxi. 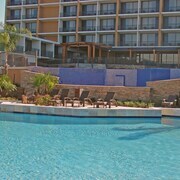 With 6 Expedia-registered accommodations, Ocean Springs is the area with the largest selection of Biloxi accommodations. Ocean Springs is situated 13 kilometres (8 miles) from the center of town. The Holiday Inn Express & Suites Ocean Springs and Magnuson Hotel Ocean Springs are amongst the accommodation options in Ocean Springs. You can also find somewhere to base yourself in Gulfport, which is the neighborhood where you'll find the Residence Inn by Marriott Gulfport-Biloxi Airport and Courtyard by Marriott Gulfport Beachfront, or Moss Point, which has the Hampton Inn Moss Point and Holiday Inn Express Moss Point. Diamondhead is 45 kilometres (29 miles) from Biloxi's downtown, while Pascagoula is 30 kilometres (20 miles) from the center of Biloxi. The Diamondhead Inn & Suites and Econo Lodge Inn & Suites are located in Diamondhead, while Super 8 Pascagoula Ms and The Grand Magnolia Ballroom & Suites are in Pascagoula. The Biloxi Lighthouse and the Beauvoir-The Jefferson Davis Home and Presidential Library are popular Biloxi, attractions and many visitors choose to stay close by. The Hampton Inn Biloxi and the DoubleTree by Hilton Hotel Biloxi are close to the Biloxi Lighthouse and the South Beach Biloxi Hotel and Suites and Quality Inn Biloxi Beach are near the Beauvoir-The Jefferson Davis Home and Presidential Library. Families, students and those keeping an eye on their dollars can choose from nice Biloxi accommodation options that definitely won't that won't make the bank manager's jaw drop. 20 kilometres (13 miles) away from Biloxi's downtown you'll find the Clarion Inn. The Comfort Inn Moss Point is just 35 kilometres (21 miles) away. Two other Biloxi hotels in the lower price range are the Super 8 Bay St. Louis and the Days Inn Biloxi Beach. 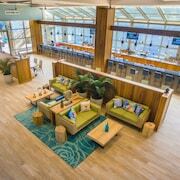 The Holiday Inn Gulfport Airport is located 20 kilometres (13 miles) from the center of Biloxi. 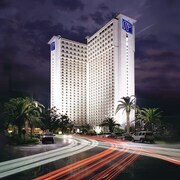 Alternatively, the Holiday Inn Biloxi - Beach Blvd is located 5 kilometres (3 miles) away. Some other Expedia-listed hotels are the Home2 Suites by Hilton Biloxi North/D'Iberville and the Comfort Suites Biloxi - Ocean Springs. For those keen to see more of the coastal plains and wetlands common in this part of the world, you might also book a few days in other destinations in Coast Region. Enjoy shore fishing or venture out to see the region's tourist attractions. Comfortable hotel accommodations are available. 20 kilometres (12 miles) away from Biloxi you will find Gulfport, where you can explore Lynn Meadows Discovery Center and Gulfport Premium Outlets. The The Almanett Hotel and The Guest House at Gulfport Landing are some of the fabulous Expedia-listed apartment and hotel alternatives in Gulfport. 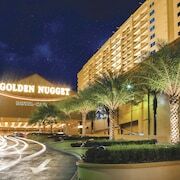 Or stay in East Biloxi, 1 kilometre (1 mile) to the northeast of Biloxi, where you can pick from the Golden Nugget Biloxi and Harrah's Gulf Coast. The Beau Rivage Casino and John Henry Beck Park are just a couple of the more popular points of interest to see when visiting East Biloxi. For those travelers planning on arriving or departing via Gulfport - Biloxi International Airport, you may plan to book accommodation at Hilton Garden Inn Gulfport Airport, or Comfort Suites Gulfport, which are both a short taxi ride away. What are the most popular Biloxi hotels? Are there hotels in other cities near Biloxi? 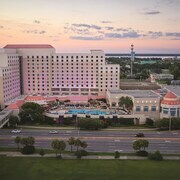 What other types of accommodations are available in Biloxi? Explore Biloxi with Expedia.ca’s Travel Guides to find the best flights, cars, holiday packages and more!